Das Wirtschaftswachstum belebt sich in den mittel- und osteuropäischen Ländern (MOEL) langsam, bleibt jedoch schwächer als vor der Wirtschaftskrise. Einige der kleinen, offenen Volkswirtschaften der Region wahrten durch Abwertung oder auch Produktivitätssteigerung ihre preisliche Wettbewerbsfähigkeit. Der überwiegend starke Exportaufschwung trug zur Erholung der Industrieproduktion bei. Aufgrund der dynamischen Ausfuhrentwicklung und der Schwäche der Inlandsnachfrage verringerten sich die Leistungsbilanzdefizite 2010 weiter; in den kommenden Jahren ist allerdings wieder mit einem leichten Anstieg zu rechnen. 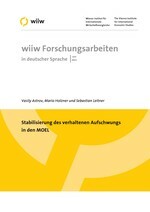 Mit der Verbesserung der Kapazitätsauslastung werden die Anlageninvestitionen 2011 in allen MOEL ausgeweitet. Auch die Nachfrage der privaten Haushalte wächst, allerdings eher verhalten. Die weltweite Verteuerung von Nahrungsmitteln und Rohstoffen bewirkt auch in den MOEL eine Inflationsbeschleunigung. Der Kreditmarkt leidet in den MOEL nach wie vor unter einer Kreditklemme und einem relativ großen Anteil uneinbringlicher Kredite. In den meisten MOEL schwenkte die Budgetpolitik 2010 auf einen ausgabenseitigen Konsolidierungspfad. Aufgrund des mäßigen Wirtschaftswachstums wird die Beschäftigung erst ab 2012 so stark zunehmen, dass die Arbeitslosigkeit merklich sinkt. The outlook for the world economy improved in the course of 2010 and the recovery has now gained strength in the EU as well. The Central, East and Southeast European (CESEE) countries have also recovered from the crisis; most of them recorded positive GDP growth rates. On average, their exports have been growing at an even stronger pace than before the crisis. On the other hand, industrial output has so far not surpassed pre-crisis levels. The persistent unfavourable development in construction and fixed investments – both rates echoing the still hesitant credit markets – represents one of the key internal risks that could negatively affect the rather optimistic regional economic forecast. The general outlook for the CESEE region in the baseline scenario expects a gradual strengthening of economic growth over the period of 2011-2013, usually not exceeding 4 per cent p.a. GDP growth will become more broadly based. The formerly predominant role of external demand will weaken somewhat, while both household consumption and gross fixed investments will ultimately contribute positively to GDP growth. With exports, industrial output levels and eventually also GDP growth already recovered or on the road to recovery, the economy is seen as having largely returned ‘back to normal’ – yet with at least two important differences: (i) post-crisis growth will be slower; that slower growth, however, also implies that (ii) the labour market situation will be ‘very far from normal’ as unemployment will remain high, with young and low-skilled workers being especially adversely affected, and any improvement only gradual and delayed. Inflation rose throughout 2010 as food and commodity prices soared; in general, however, it will pose no (or little immediate) threat. The moderate economic upturn and a revival of capital inflows have resulted in renewed pressure to appreciate the currency. The forecasts point to a gradual deterioration of current account positions in all CESEE countries. The financing constraint with respect to both domestic and external loans will constitute one of the key brakes on future economic growth. Given the sorry state of public finances and the ensuing budget consolidation efforts, we cannot expect any further growth-stimulating measures from the public sector – on the contrary, owing to the limited fiscal manoeuvring space government deficits and public debts will have to be scaled back.